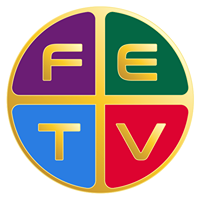 Religious TV Channel / FETV is a television network that broadcasts on channel 5 in Panama City, and is headquartered in Panama City, Panama, with repeaters throughout the country. The network and stations broadcast in the NTSC format. The network takes its name from the Television Education Foundation (FETV), its owner. In 1990, the Catholic Church of Panama sought to create an educational television station in the country, and with the leadership of other churches and the commercial broadcasters, the Television Education Foundation (Fundación para la Educación en la Television) was formed. The next year, the station received its frequencies to operate, and it bought the equipment used to operate FETV's predecessor on channel 5, Panavisión/Telecinco, in bankruptcy from Cofina, a governmental financial entity which had taken the channel 5 facilities as collateral for debts that Telecinco owed to the government.